Guacamole, while delicious, is actually fairly destructive. This is thanks in part to a compound called persin, which is present in the fruit and leaves of the avocado tree (Persea americana). Persin is an acetogenin (a type of polyketide) made via the same biochemical pathways the avocado plant uses to make its delicious fatty acids. In fact, it closely resembles linoleic acid, an essential omega-6 fatty acid. For some reason, persin is usually harmless to humans (though it may be responsible for some avocado allergies) but can seriously mess with other animals including birds, non-human mammals (including dogs and horses), and fish. Avocados are particularly toxic to birds. In one incident, a flock of 120 ostriches ended up in an avocado orchard and ate some leaves and unripe fruit. Within days, nine of them were dead by congestive heart failure. In non-human animals, avocado consumption can cause selective necrosis (uncontrolled cell death) of the milk-producing lining of the mammary gland (in lactating animals) and the walls of the heart (thus the ostrich heart failures). Persin appears to accomplish this damage by sliding inside cells and disrupting the ability of their mitochondria to store up chemical energy in the form of ATP. After eating avocado leaves, lactating rodents and livestock often develop udder-related problems such as inflammation (mastitis) and wonky milk secretion (agalactia). In keeping with its propensity for damaging mammary glands, persin is capable of killing human breast cancer cells. Not only that, it can boost the cytotoxic (cell-damaging) effects of tamoxifen, a popular breast cancer drug. This includes overcoming resistance to tamoxifen, which is great since cancer cells have a tremendously annoying tendency to become resistant to the drugs we use to off them. Although avocados can cause heart damage, they also may help protect against heart attack (and stroke). It turns out plants are complicated organisms, so persin isn't the only acetogenin found in avocado fruit. Other acetogenins such as persenone A can inhibit platelet aggregation and prevent arterial thrombosis in lab animals. In other words, they can oppose the formation of a blood clot in an artery. As you might expect, this is a very bad thing since such a clot can potentially block the blood supply to parts of your heart or brain. 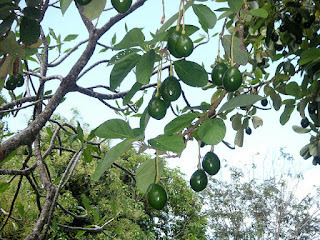 Avocados also contain defensive molecules capable of inhibiting the growth of fungi and insects, particularly those species known to munch on avocado plants (e.g. Colletotrichum gloeosporioides, a fungus also known to attack yams and papayas). So there you have it, avocados are a double-edged sword able to smite hearts and heart-blocking clots, and udders and breast cancers. Buoro IB, Nyamwange SB, Chai D, Munyua SM. 1994. Putative avocado toxicity in two dogs. Onderstepoort Journal of Veterinary Research 61(1):107-109. Burger WP, Naudé TW, Van Rensburg IB, Botha CJ, Pienaar AC. 1994. Cardiomyopathy in ostriches (Struthio camelus) due to avocado (Persea americana var. guatemalensis) intoxication. Journal of the South African Veterinary Association 65(3):113-118. Oelrichs PB, Ng JC, Seawright AA, Ward A, Schäffeler L, MacLeod JK. 1995. Isolation and identification of a compound from avocado (Persea americana) leaves which causes necrosis of the acinar epithelium of the lactating mammary gland and the myocardium. Natural Toxins 3(5):344-349. Rodriguez-Sanchez DG et al. 2015. Isolation and chemical identification of lipid derivatives from avocado (Persea americana) pulp with antiplatelet and antithrombotic activities. Food & Function 6(1):193-203.